"Nisa Homes came about when we realized many women who experience homelessness, especially newcomers and refugees, weren't equipped with the tools and skills necessary to become independent and self-sufficient long term.” said Mahwish Ayub Regional Manager for Nisa Homes. 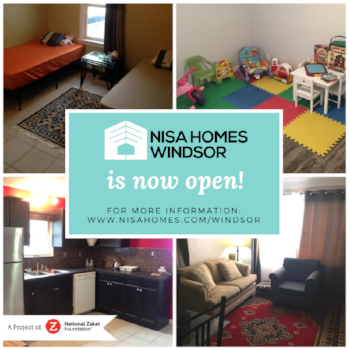 “This is where Nisa Homes hopes to step in, by building onto the current services available in the city, our second stage transitional home aims to help women and children break out of the cycle of poverty and homelessness." The home is open to any woman in need, but most of the clientele identify as Muslim. Many are recent immigrants or refugees. Some are homeless, while others are trying to leave behind abusive homes and start afresh. The city of Windsor hosts one of Canada’s largest Muslim populations per capita. As an economical border city, Windsor attracts migrants and refugees. Over the years, Windsor's community has seen a growing number of Muslim women needing shelter and assistance. Our research showed that about 25-30 visibly Muslim women accessed shelters across Windsor in 2016 alone, while mosques had at least 2-3 women reach out monthly, either in need of assistance with housing or help accessing services. The facility will accommodate up to eight women and children and provide them with assistance for up to three months. Nisa Homes, a project of the National Zakat Foundation, a registered charity, is the first and only transitional shelter for Muslim women and children experiencing homelessness due to domestic violence, poverty, and resettlement challenges. Nisa Homes has been operating two other locations in Mississauga, Ont. and Surrey, B.C. since 2015.